Asha Duniani (The Girl), Shayla Love (Wife No. 1), and Parris Sarter (Rita) star in Synchronicity Theatre’s production of Eclipsed. Between scenes as Michonne on The Walking Dead, actress Danai Gurira has established herself as a groundbreaking playwright. In 2016, her play Eclipsed became the first production to premiere on Broadway with an all-black, all-female creative team and cast (actress Lupita Nyong’o starred). 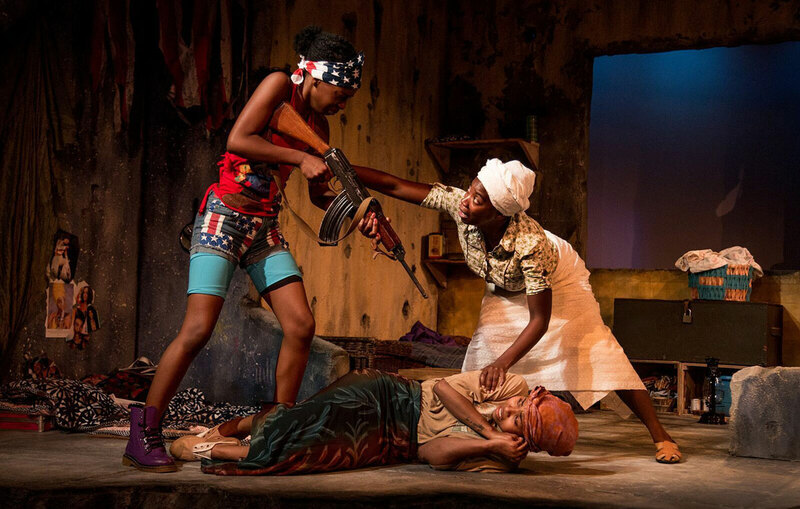 Set near the end of the Second Liberian Civil War in 2003, the play tracks five Liberian women as they come together “to negotiate power, protection and peace,” and Gurira flew to the war-torn region to interview 30 female freedom fighters during the writing process. This month, Eclipsed makes its regional debut at Synchronicity Theatre. We spoke with the theater’s producing artistic director Rachel May, who also co-founded Synchronicity, about the production’s significance. What was it about Eclipsed that made you want to host the premiere? I’ve been tracking this play since before it went to Broadway. About 85 percent of our plays are written by women. But more importantly, we strive to uplift and empower women’s voices. There are so few stories where African women get to tell their own stories without a white person or a man having a say. Danai (whose family is from Zimbabwe) just decided to let these women speak for themselves. There’s some harrowing material in Eclipsed but it also feels universal. What messages does the play have for Atlantans? It is harrowing material but the women in the play are as complicated as any of us. They’re broken and damaged and ravaged but they are also resilient and beautiful, loving, and hilarious. There are more than 20,000 Liberian people living in our metro area and there are 60 Liberian churches. We have a partnership with the Liberian consulate. That gives us an opportunity to not only bring authenticity to our actors but we’re able to bring the Liberian community into our theater and present this work to them. Do you expect Danai Gurira to put down her Walking Dead sword and drop by to offer creative input? Actress Tinashe Kajese is making her professional directorial debut with this production, and she has a unique connection to Danai: they were in a Brownie troop together back when they were growing up in Zimbabwe. We would certainly love Danai to come by for any reason. Tinashe and Danai have had conversations together about the play. If she’s in town filming and has a break, she has an open invitation. Eclipsed runs Wednesdays through Sundays now through June 25.